Nest 3rd Generation Programmable Wi-Fi Learning Thermostat: Take control of your home's heating and cooling without lifting a finger with this thermostat, which learns your habits and adjusts to automatically regulate your home's temperature based on your schedule. The Nest Leaf feature alerts you when you choose a temperature that's energy efficient. 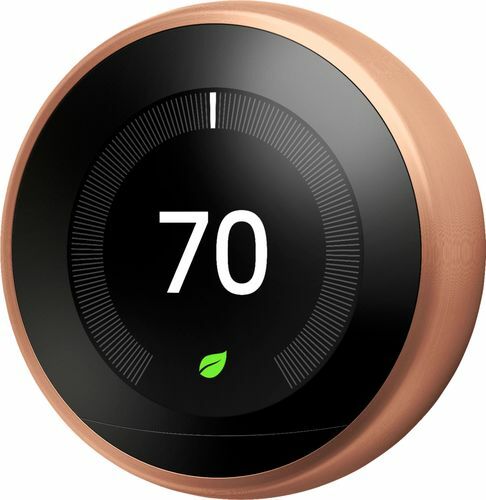 ENERGY STAR Certified: The Nest Learning Thermostat is the first thermostat to get ENERGY STAR Certified by the EPA. Customized compatibility: System Match activates features that work with your specific heating and cooling systems, and connects to most 24-volt forced-air, heat pump with AUX, dual fuel and radiant systems.